Flip through any home décor magazine and you’ll notice that the ceilings are almost always painted – and, more often than not, in bright, bold colors. Designers never omit the ceiling when designing the color scheme of a space. After all, the ceiling is the largest area of uninterrupted surface in a room. Therefore, the color you choose for a ceiling will dramatically impact the room’s overall effect. A grand room with high ceilings can feel impersonal and unbalanced after you’ve added furniture, rugs, drapes and wall art. Why? Because all of these embellishments occupy the bottom half of the room. Meanwhile, the top half is left bare and boring. In a room such as this, try painting your ceiling a deeper shade of the wall color. This will pull the eye upward, and harmonize the room from top to bottom. Many designers love the idea of an accent wall. Well, why not make the accent wall your ceiling? An unexpected pop of color on the ceiling in a room with neutral colored walls can add personality and charm to a room. If you need help deciding on a color, just look to the furnishings and other room elements for inspiration and choose a color that complements them. 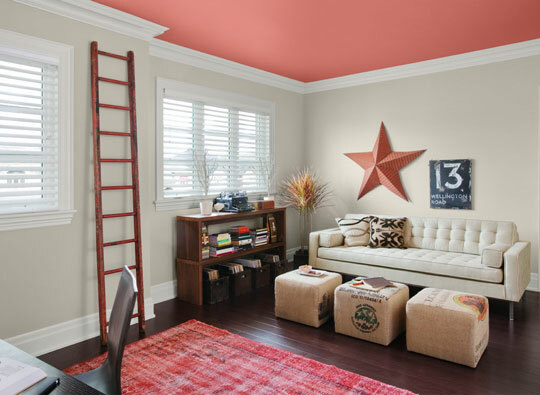 If you don’t want to paint your ceiling a vibrant color, that’s no problem! Paint your ceiling a color that is a few shades lighter than the color you have on your walls. Tip: Even a light shade of color is better than white – stark white ceilings are visually disruptive and can break up the flow of a room design. Experiment with your bedroom. Warm, organic colors on both the walls and ceiling create a cozy yet elegant look. It can also help unify your space by tying into other design elements, like rugs and furniture. If you live in an older Victorian or Colonial home with a lot of woodwork detail, add drama to a room by painting a dark tone on the ceiling. This brings the eye down and allows the room’s architectural details to become to main focal point. Experimenting with painted ceilings is a lot of fun, and you will be surprised and pleased by the outcome. Ceilings often go unconsidered during the decorating process, but they represent a golden opportunity to highlight, complement, accent, and add drama to your room. Happy designing! Do you have a painting project in mind? 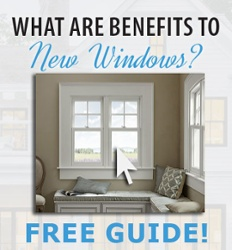 Stop in to your local GNH Lumber for tips, ideas, help planning and project guidance! 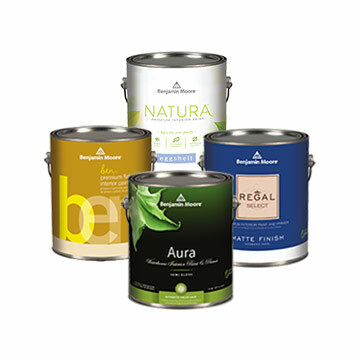 We carry a wide selection of Benjamin Moore paints & finishes.